I’ve so far filed a couple of reports from my recent visit to Western Australia, and to a weekend of events staged at the Howard Park winery in Margaret River. These notes however, come from what was – in theory – an informal evening spent in the ocean-front home of Howard Park’s owners, Jeff and Amy Burch (right). The evening was indeed informal, with a serve yourself buffet of delicious lasagne, moussaka and other homely foods, but the array of wines lined-up by Jeff was staggering, and forced me to curtail my eating for a couple of hours to really do these wines justice. I should have known what was to come, when earlier in the day Jeff had invited me and fellow guest, UK journalist Sarah Ahmed, to choose a bottle each from his cellar to have with dinner. Jeff’s collection is staggering and whilst Sarah hummed and hawed over a couple of bottles, Jeff reached for a bottle of Romanée-Conti’s La Tache 2000 and said “why don’t we give this a go?” I was pondering a number of options too, when again Mr Burch rather forced my hand: “The ’66 Cheval Blanc? That should be drinking alright,” and so our decision was made and the tone for the evening set. Included in this line-up where some fascinating slices of Margaret River history too. The region was first planted for wine only in the 1970s, and the 1974 Vasse Felix and 1978 Cullen on tasting here were both, to the best of Jeff’s memory, the first commercially released vintages of each wine. 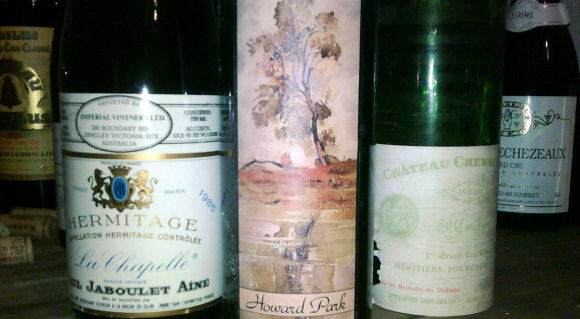 What an extraordinary night this was – and I know despite my best efforts, I missed a couple of bottle too! First commercial release. Sweet, curranty fruit, a touch volatile, but great fruit at the core. There’s a blackcurrant richness here still, and a touch of coffeeish warmth in the finish. That sweetness is terrific. 91/100. 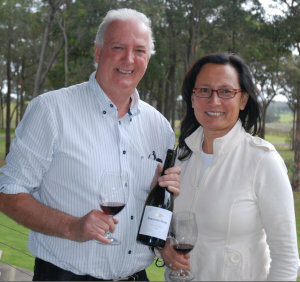 See all stockists of Vasse Felix Cabernet on wine-searcher. First commercial release. Fantastic blackcurrant nose, a big background of vanilla and an earthy quality. The palate has really intense blackcurrant and the soft, still voluptuous. 93/100. See all stockists of Cullen Cabernet on wine-searcher. A bit of eucalypt character and some green but then a plummy focus comes through. Becomes warming and spicy, with lots of chocolaty richness building. 92/100. See all stockists of Howard Park Cabernet on wine-searcher. Sparkling shiraz invented to fill the Champagne gap at the end of the world war II. Big, funky, eucalyptus nose, a huge leafy black fruit punch and a touch of vegetal quality. The palate still has a hint of sweetness, and a beautifully clear palate with crisp cherry acidity. Delightful old stuff. 91/100. See all stockists of Seppelt Sparkling Shiraz on wine-searcher. Lovely, rich, fennel and herbal nose, with lots of apple and some pear skin quality, a touch of vanilla. The palate is riven by a beautifully lemon peel zest and precision. Wonderful length and definition, and power too. 93/100. See all stockists of Blain-Gagnard Chassagne-Monrachet Morgeot on wine-searcher. Lovely, gamy, perfumed nose, the earthy, slightly green quality, sits beautifully with tight black fruit. Right at the core of this is a fantastic core of sweet fruit and the silkiest tannins. Fabulous espresso richness. Beautiful, long, balanced. 94/100. See all stockists of Cheval Blanc on wine-searcher. Lots of leafy notes but a great smokey bacon background too, the sweet red fruit pushes through onto the palate maintining a real edge. Beautiful, and fantastically long. 93/100. See all stockists of Jaboulet Hermitage La Chapelle on wine-searcher. Lovely hint of truffly undergrowth, the polished wood and dark cherry skin bite fabulous wine, hinting at dark, chocolaty tones but maintaining that fantastic clarity and crisp focus. 95/100. See all stockists of Bruno Clair Gevrey-Chambertin Clos St Jacques on wine-searcher. From magnum. Beautifully sweet, gamy, cherry ripe and silky but has a seduvtive smoky depth and a really plushness to the fruit. The fruit on the palate is absolutely beautifully silky, sweet and ripe. Fat cherry fruit tinged with chocolate, fantastically long and focused, a beautiful wine. 92/100. See all stockists of Germain Beaune Teurons on wine-searcher. Nice, earthy, maybe sulphidic nose, buit gloriously so. Sweet, cedary, warm and coffeeish notes too and a ripe core of fruit. The palate is leaner than the bruno Clair, and slightly less layered, but has extraordinary focus. Long spicy and utterly delicious again. 93/100. See all stockists of Rousseau Gevrey-Chambertin Clos St Jacques on wine-searcher. Great, earethy, undergrowthy and slightly leafy. The palate is pretty spicy and tight, the cherry and ripe black fruit edged with a peppery spice. Quite lean and linear. Needs time. 91/100. See all stockists of Mongeard-Mugneret Grands Echézeaux on wine-searcher. Similalry lifted, leafy notes, the black fruit spicy and with a toastiness. The palate has more ripe, sweet fruitiness than the 1996 at this point, with a slightly plumper, slightly more charming character. 92/100. See all stockists of Mongeard-Mugneret Grands Echézeaux on wine-searcher. From magnum. Fantastically rich, seductive nose. The colour is much more evolved than the Beaune, but whilst this is open and charming, there’s a firmness and a firm cherry backbone. Lovely old polished wood, touches of spice and ground coffee. Lovely structure and power in this. 94/100. See all stockists of Comte de Vogüé Musigny Vieilles Vignes on wine-searcher. Quite a dry, ashy character, with a touch of nut husk and a developing touch of coffee and deep earthy. Very fine. 92/100. See all stockists of Comte de Vogüé Chambolle-Musigny Les Amourouses on wine-searcher. Lovely silky, soft, very feminine with lots of brown sugar and soft, sweeet, earthy quality. The palate has that core of orangy acidity and very fine tannins. Quitye light, but silky and has a complex perfume with touches of game and meaty qualities in amongst the sweet cherry fruit. 93/100. See all stockists of Pousse d’Or Volnay le Bousse d’Or on wine-searcher. Seems a little bit stalky perhaps, but the quality of black fruit does come through, with a tight, sinewy core and some kirsch-like cherry perfume. Its just a little lean, and the palate has the same slightly pinched quality – which is absolutely not to say it is a poor wine. It has lovely structure and a sinewy fruit quality, and a long spicy finish. 91/100. See all stockists of Romanée-Conti Grands Echézeaux on wine-searcher. Fantastically perfumed, with notes of root ginger, beautiful floral edges, a touch of cherry and a little green leafiness. The palate is pretty tight, the fruit silky textured, this has terrific elegance and tight extremely refined iron oxide minerality. 95/100. See all stockists of Romanée-Conti La Tâche on wine-searcher.